You can find, on nearly every financial website, suggestions on how to develop and maintain good financial organization and discipline. Organization means the nuts and bolts of managing money: keeping a checkbook, developing a budget, making specific savings goals, setting up direct deposit into a savings account. Without these tools it’s very difficult to have a sense of where your money is going and whether you have enough. Discipline means using these tools consistently and responsibly to avoid pitfalls like impulse purchases, missed payments, or payday loans. Good discipline includes checking your account balances frequently, making consistent deposits into savings and retirement accounts, avoiding frivolous use of credit cards, researching lenders (and reading the fine print!) before taking out loans, and other good money habits. There is a third ingredient required for financial success, however, that doesn’t get talked about as much: faith. Faith means believing that you are capable of achieving financial health—no matter your current income or situation. Faith alone can make or break anyone’s finances. Faith can give you determination or the lack of it can sap your energy. 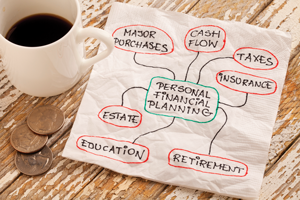 Many people on small incomes manage to lay a solid financial foundation for themselves by making deliberate, well-informed choices and managing their accounts carefully. Many others never succeed at digging out of financial insecurity (whether born to it or after an experience of downward mobility) because they don’t believe tomorrow can ever be better than today. So how do you get from hopeless to hopeful? According to research by the Pew Charitable Trusts,eight in 10 Americans are in debt, and every year six in 10 American families experience a financial shock they can’t pay for with savings. If your finances are precarious, you’ve got plenty of company, so don’t waste time on guilt or “if only” thinking. It’s easy to lose faith, especially if you’ve experienced job loss or death of a family member whose income you relied on, or have struggled to make ends meet for too many months (or years) in a row. But like most setbacks in life, the part you have the most control over is how you react to it. Letting go of knee-jerk negativity is the first step toward a better future. Someone who believes his financial situation will always be hopeless is very unlikely to prove himself wrong. Someone who believes she can find ways to improve her money situation is very likely to prove herself right. The next step is to decide to change. Develop “unbelievably fierce, focused intensity,” as Dave Ramsey advises. Imagine what your life would be like with no more debt. Imagine what it would be like to be able to simply write a check when a bill comes in, instead of panicking. Skip getting depressed and focus on the action steps recommended by so many financial advisers: pay down your debts, lower your bills, look for ways to increase your income, put even small amounts into savings regularly, avoid unnecessary expenditures, and increase your financial literacy by seeking out information and trustworthy advice. You don’t have to be rich and comfortable to do these things, you just have to believe that you can—and then do them.